Looking for PDF FlipBook, Flipbook Maker, 3D Flipbook, Responsive Flipbook, or just a flipbook plugin for wordpress? Presenting DFlip 3D FLIPBOOK WordPress plugin with PDF support. 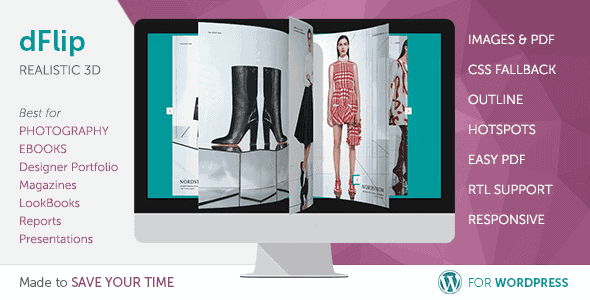 Create interactive, realistic & responsive FlipBook with just a PDF link. Based on realistic 3D mockup library and powerful 2D CSS3 transformation you get the best possible flip-books in a single plugin. Start with 3D and the plugin will take care of fallback in case some browsers don’t support 3D and use 2D Flipbook. Switching from 3D to 2D easily. Or you can rely on our smart Fallback. PDFs or Images we got it covered for you.